Olympia Faucets offers a quality line of faucets, valves and bath hardware at a very competitive price. All Olympia products are manufactured to specifications that meet or exceed all pertinent codes and regulations and are nationally distributed from our distribution facility located in Nashville, TN. 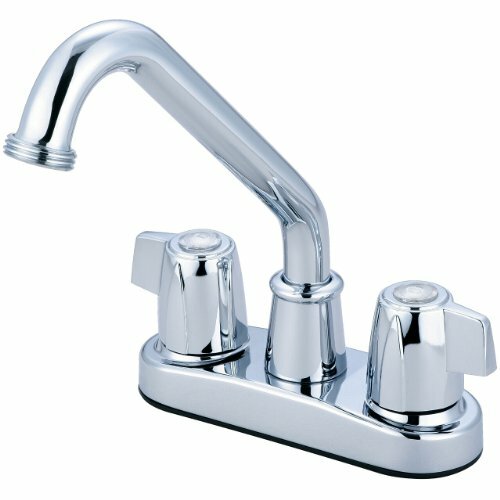 Two Handle Laundry Faucet, Mini Blade Handles, Hi-Tubular Spout Swivel 360°, 5-1/2-Inch Reach, 5-13/16-Inch From Deck to Aerator, Washer less Cartridge Operation, 2 or 3-Hole 4-Inch Installation, With 1.5 GPM Flow Rate, Chrome Finish. If you have any questions about this product by Olympia Faucets, contact us by completing and submitting the form below. If you are looking for a specif part number, please include it with your message.